Margaret Haerens is a writer and researcher who has written extensively on American politics, policy, and history. Haerens, Margaret. The NFL National Anthem Protests. ABC-CLIO, 2018. ABC-CLIO, publisher.abc-clio.com/9781440869044. 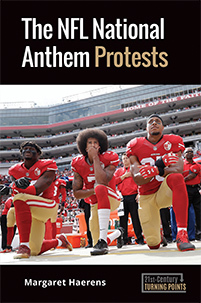 This volume provides a concise but authoritative overview of the NFL national anthem protests and the fierce debates they have sparked about patriotism, constitutional rights, military service, police brutality, and social justice.